Nestled in the middle of 5 Points is Sun-Ray Cinema. The historic building was once home to the Riverside Theater, which opened in 1927 and was the first theater in Florida equipped to show talking pictures. In addition to sound, the theater also had the distinct advantage of air conditioning - something that is still valued to this day in our hot Southern climate. Inside the doors of Sun-Ray you’ll find a unique theater experience. 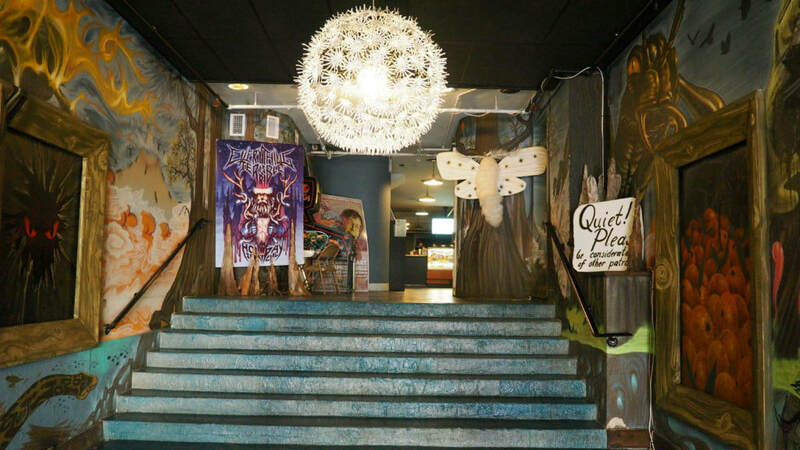 The interior walls are adorned with murals painted by artist Shaun Thurston and the theater offers a full menu (including vegan friendly snacks and entrees), with the names of food items linked to Jacksonville's film history. In the middle of San Marco Square is the San Marco Theatre, which was built in 1938. The theater and its art deco facade were designed by architect Roy A. Benjamin. This isn't the only theater that Benjamin designed. He also designed the Imperial Theatre (demolished), the Palace Theatre (demolished), the Riverside Theatre (now Sun-Ray Cinema), and the Arcade Theater, as well as serving as Associate Architect during the development of the Florida Theatre. In 2001, USA Today included the San Marco Theatre in their list 10 Places to See Classic Cinema. Entrance to Sun-Ray Cinema. Murals by visual artist Shaun Thurston.